Rep. Randy Hultgren gives the keynote address at ABA’s inaugural Payments Forum in June. Photo by Stephanie Ascari. As banks continue to adapt to an ever-changing fintech landscape, lawmakers are similarly working to define their approach to innovation policy. 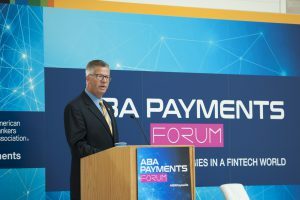 We recently sat down with House Financial Services Committee member Randy Hultgren (R-Ill.), co-chairman of the House Fintech and Payments Caucus and keynote speaker at ABA’s Payments Forum in June, for a conversation about the intersection of technology and financial services, and what it means for the nation’s banks. Q: What in particular sparked your interest in fintech? A: I serve on both the House Financial Services and the Science, Space and Technology Committees, so that intersection of technology impacting finance, impacting service to consumers and new opportunities for people to get access to financial tools is very interesting to me. And even as just a consumer, [I’m] amazed by the ease of being able to do my own banking and trading from my phone. It really is a pretty exciting new world, but we’ve got to make sure we understand as a government how do we do this well, how do we make sure we’re not crushing new innovation through regulation—but at the same time, protecting consumers and making sure that financial information is secure. Q: What can Capitol Hill do to help encourage innovation? A: The main focus of the caucus is education—helping my colleagues understand the new opportunities that come with new technology, but also the challenges: how do we regulate, what do we regulate, how do we [encourage]innovation while making sure that markets are working, customers are protected and that there’s a confidence with these new tools. I think there will be potential for hearings we can have in the Financial Services Committee focused on fintech issues, and a lot of overlap with some other areas as well. Q: Is there a nexus between where you are with fintech policy and overall financial institution regulatory policy? A: I’m concerned about it. I’ve been pretty vocal in my time on the Hill that I agree with my banking friends—that there has been this huge amount of cost and time and challenge with regulatory compliance. The reality [is]that when there’s a demand out there, markets will find a way and entities will find a way, but [they]sometimes find a way that gets around regulation. That’s not fair to the great banks that are out there playing by the rules, doing the right things, and yet are being hindered from fully engaging in benefits that technology can bring to their customers. Something we want to continue working toward is making sure that as new technology entries join in in providing financial tools, our existing financial institutions can do the same—that we’re not giving benefit to one over the other. Q: Do you think banks and fintech companies need a safe space within which to innovate? A: I do think if there’s this cloud of litigation [or]the regulatory hammer coming down, it can become a discouragement to them from trying something new. So it really is [about]finding that sweet spot: an environment that encourages new steps in using technology to provide better customer service or better access to banking. Absolutely we want to do that, and if there’s things we can do to take [away]some of the threats or concerns, whether it be litigation or regulatory challenge, I think we need to keep looking at that. Q: What are your thoughts on the OCC’s special-purpose bank charter for fintech companies? A: I’ve been a little disappointed. I’ve been involved in the last couple years in encouraging them to be open and deliberative and to take input from all people involved or impacted by this and was disappointed that it wasn’t as open of a process as I would have liked it to have been. My hope is with the new administration with some new people, we’ll be able to continue to look at this and study it and figure out how [to]do this well. I think there’s still opportunity there—I’m not going to give up on the process or potential for some good to come out of the OCC. Q: You come from a heavily community-banking oriented state and district. What would you say to community bankers when it comes to fintech? A: I want to give them hope. 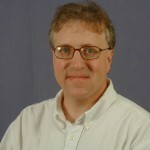 I think one of the things technology can be [is]an equalizer. It can provide some unbelievable abilities to serve, even from a relatively small platform. A relatively small community bank can do some of the same types of things that some huge entities can do. The reality of competition from some of these new entries can be seen as a threat, and I understand that. But I also think there are opportunities for partnerships if we do it well, if we are encouraging all people, all entities to have good, positive access to this stuff. I think it’s going to be a good opportunity for our local community banks as well. I want them to thrive, personally—my story is one of great gratitude for a community bank that really opened up opportunities within my own family and my family’s small business back in Wheaton, Ill. So I want to make sure that that’s a part of future opportunities for others as well. Q: How can bankers engage with lawmakers on fintech going forward? A: These are challenging times—we want to continue hearing from our friends in the banking community. Together, how can we keep finding new technologies, new discoveries, new opportunities to create value, to create convenience [and]a confidence in these technologies? Being very confident in our local community banks and their work and also making sure that they’ve got the access to this technology can be great for customers and for growing our economy—which is ultimately what we want to see happen.